Breakfast time! I haven’t eaten strawberries in so long and when I saw then in the grocery store I couldn’t leave without them. 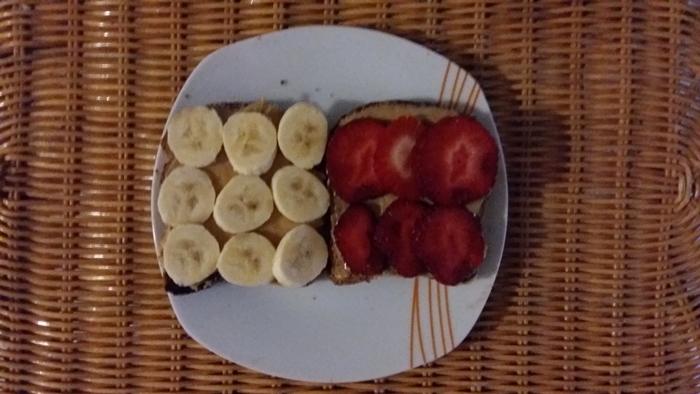 So, I just toasted some bread, placed some peanut butter to get my protein and chopped up some fruit on top to get some sugar in my breakfast. Of course that I have a coffee on the side because there’s no life without coffee. I try to eat better because my organism was feeling down due to late night studying and exhaustion but there is one thing I’ll never be able to get out of my food menu and that’s bread. I used to even eat it with pasta before. But at least I try to eat whole grains bread. Today I’m spending all day at home but tomorrow I’m off to my university again. Can’t wait for the weekend to go out partying and also I had a deal with my roommate to treat ourselves with some pancakes after the exam. I’m also working on a new poem so I hope I’ll have it up by the weekend or at least next week. Enjoy your day everyone. Kisses!